When drivers remove car stickers off their windshields and windows, many of them tend to grab their car keys and scrape away at the sticker. This is a bad way to remove stickers. Not only does it scratch the glass, it helps peel off the paper but leaves behind glue on the windows and windshields. Other objects people tend to use to remove decals and stickers are shaving razors and screwdrivers. Although these tools are absurd for removing stickers and decals, people still use them. Never use these items, as they can destroy your auto glass and lead to a car glass repair. For a safer method, get a spray bottle, fill it up with water, and spray the decal or sticker. Alternatively, you can wash your entire car and go from there. The way water works is that it softens the sticker enough to help you add other products that do the rest of the removal. Once you have wet the sticker, pick at one corner of the decal with your fingernail, moving diagonally toward the opposite corner. The sticker might tear up a little bit of the way through. Though, you will just have to pick another corner and repeat this step until all corners are torn. Try your best to get as much of the paper off before the corners tear. Afterward, attempt (carefully) to remove what remains of the paper with your fingernail. Be gentle, and if the rest does not come off, leave it alone. A couple of products on the market are safe to use on auto glass. Some of these products are rubbing alcohol, acetone, and WD-40. We recommend WD-40 because it was designed for the removal of such items as tar, bugs, stickers, and more; it is literally a penetrating oil that helps soften and wipe out unwanted elements. Take WD-40, or the other products mentioned, and rub or spray it on the decal. Then, leave the product to set for a minute or so. While you let the WD-40 set, grab a special windshield-safe razor blade handle and use it to peel off the decal. You can find these razor blade handles in your local auto store. Though they are called “razor blades,” they are not your typical shaving razors. Thus, they do not damage the glass when you use them to remove stickers. Take the special razor blade and gently slide it against the sticker, peeling it as you go. This should remove all the paper and glue remaining. Once you are done with all the steps above, clean the glass as you would when you clean your car. Just be sure to use a microfiber cloth to wipe the glass (they are gentle on glass). Making sure to clean the glass properly at the end ensures that you wipe away any residue from the WD-40, acetone, or rubbing alcohol. Simultaneously, doing so keeps the glass in a great condition. 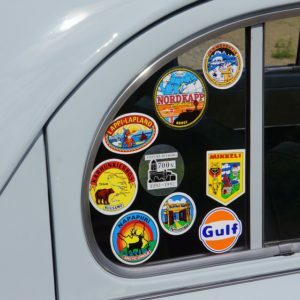 When removing a sticker or decal off your windshields and windows, doing it the right, safe way can help you avoid a car glass repair.